In many locations throughout the world, the challenge of environmental awareness and responsible tourism is clear and critical. Battle lines are easily drawn between exploitation and preservation. Species are rare and threatened, habitat is encroached upon from all sides, everyone from developers to subsistence farmers is eager for economic opportunity, and environmentalists are desperate for money and publicity. Even in the lower 48, wildlands and habitats that recently enjoyed wide margins of security are now shrinking islands in a growing flood of freeways and sprawl. Not so Alaskanot yet. In part, Alaska represents the best we have managed so far in environmental foresight and planning. ANILCA (see page 12) was a watershed in environmental legislation. The Tongass National Forest Management Plan is an exacting agreement laden with protections for air, land, water, wildlife, and scenic value. Even the generally pro-development state government has set aside over 3 million acres to parks and preserves for critical habitat, scenic value, and recreational usesover one-third of all the state park land in the United States. In many ways, however, it has been relatively easy to parcel out huge chunks of the state for preservation. With extensive public ownership, a small population, limited infrastructure, and the high cost of resource exploitation, the challenges to preservation sometimes seem faint and remote. Besides, there was enough to go around to all concernedat least enough so that any demands for greater allotments by private, native, and state concerns seemed like pure greed. 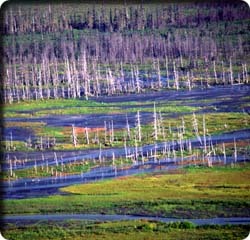 Alaska has many rough edges that can disturb the environmentally aware traveler with sensibilities developed elsewhere. Many Alaskans and others see the state as a land of raw potential for exploitation and development. Tourists represent a threat to a way of life, even as they provide needed jobs and revenue. It is no easy thing to determine what "responsible tourism" means in the context of Alaska. Small decisions about intrusion and impact are easy enough to make, but the larger choices are less clear: Do the tourist dollars that support the Alaskan economy get used to nibble away at the very wonders the tourists come to see? How many visitors does it take to remove the wildness from wilderness? Should people visit Alaska at all? My short answer to these and other questions is, "Go!" Tourist money feeds the consuming, exploiting economy, but it also steers it. The sentiments of Alaskas population are shifting with time toward preservation and careful management. Because of the influx of tourists and their dollars, environmental awareness has never been higher in the stateeven more so because of that new visitor on the scene: the "ecotourist." The term "ecotourist" has been popularized recently, mainly by private companies and organizations interested in tapping the purses of those with contemporary, "politically correct" attitudes. The label applies either to a new type of get-into-nature adventure for the typical tourist, or to a nonintrusive "style" of tourismsuch as watching whales without disturbing them, or taking a quiet kayak to the glacier instead of a cruise ship. At best, the label is assigned accurately by a tour company, enabling the consumer to choose an option that is enriching and sensitive. At worst, it is a public relations ploy that relies on a phony veneer of credibility. In reality, "ecotourism" is nothing more than a new label for a well-established approach to travel. In fact, I think "eco-traveler" is a better term than ecotourist, because "travel" implies independence and spontaneityqualities which suit an overall approach to an Alaska trip. "Eco-travel" also seems to lay responsibility for environmental awareness on the traveler, not so much on the tour provider. The eco-traveler seeks natural destinations and activities when traveling, prioritizing real parks over theme parks, hiking over shopping. The eco-traveler strives to have a minimal impact on the environment. Animals are not disturbed or fed, plants are not removed or damaged, and signs of human passage and presence are kept to a minimum. The eco-traveler studies destinations in advance, learns from the travel experience, and brings this new understanding into the future. She takes active stands on environmental issues and avoids habits of consumption that degrade the natural world. The eco-traveler maintains an attitude of respect not just for wildlife and habitat but for the history and culture of local people. The presumptions and simplistic judgments of the thoughtless visitor are avoided in favor of genuine human interaction. The eco-traveler is well advised to take ecotours within the larger Alaska travel experience. Tours that facilitate independent choices are the best of the bunch. Heli-hiking or backcountry-lodge weekends enable independence while cruise/bus package tours stifle it. Elderhostel offers an education while big-ship cruises offer scenic morsels (albeit tasty ones). Perhaps the best way to think of this book is as an overall guide to eco-travel that includes numerous options for ecotourism. The visitor to the 49th state is confronted with a different set of responsibilities and expectations than those found in other natural destinations. Some are specificlike what to do with human waste on a glacier trek or how to discourage a grizzly from breaking a wild routine for the sake of a Snickers bar. Others derive from larger issues and involve an understanding of the Alaskan culture. The following two topics provide food for thought and a look into the unique challenges of eco-travel in Alaska. In the urban and suburban regions that are habitat to most of us, hunting as a pursuit has come to seem anachronisticeven primitive. Most eco-travelers no longer identify with hunting and have little exposure to those who value or participate in it. Often, they are anti-hunting, let alone out of touch with it. If you are such a person, Alaska offers a learning experience. "Wildlife harvesting" is very much a part of the Alaskan culture and subsistence lifestyle. Game is not "killed" by hunters, but "taken." Herds of caribou are "managed" to prevent any in the herd from starving during hard winters. Whales and marine mammals are harvested in small numbers by natives living in coastal communities. Trappers set their lines to bring in the furs of fox and other small mammals. Salmon and other fish are pulled from the oceans, rivers, streams, and lakes in unbelievable numbers. Many thousands of Alaskans depend, at least in part, on their harvest of wildlife for food and income. To the non-hunter, the language of hunting may seem like a denial of the raw emotions of killing and death. You may picture an agonized moose collapsing in the bush after a bullet rips through its gut, suffering for minutes as it waits for the killing shot, but you wont hear that aspect expressed over coffee at the roadhouse. To the anti-hunter, the hunting culture can seem arcane. Can you engage meaningfully with people for whom wildlife harvesting is a way of life? I am not a hunter, but I no longer wince at the stories. Though habitat sometimes suffers a bit from motor-vehicle use, subsistence hunting in Alaska is no threat to animal populations. Trophy hunting is a different story, perhaps, but I have come to know several people involved in it and have been struck by their convictions. Some of them, at least, have a deep respect for the land and wildlife. Any stereotypes and caricatures you have may collapse if you choose to get to know such folks. The brown bear you photograph on Kodiak Island may be shot dead a month laterthe pilot who flies you in for a view may be the same one who shuttles a hunter in for the kill. You may overhear the tale in a roadhouse from one who stalked a bear, shot it for sport and a trophy, skinned it, removed the skull and claws to show the fish and game officers, and left the carcass in the bush for scavengers. The eco-traveler to Alaska is likely to interface with a very real, active, and accepted culture of sport hunting and wildlife "harvesting." How will you react? Twelve million gallons (258,000 barrels) of oil is a lot of oil. When it began draining out of the damaged hull of the Exxon Valdez and into Prince William Sound on March 23, 1989, a sequence of events followed that serves as a lasting lesson to all concerned. Brazen and idiotic corporate dissembling and cover-up were followed by a backlash response that featured plenty of mistakes. After delays and lack of preparedness exacerbated the initial problem, an awkward but huge and swift response was mounted. At the peak of activity, 11,000 people, 1,400 vessels, and 80 aircraft were at work cleaning up the oil and trying to protect critical sites. The chief damage of the spill was its impact on wildlife populations. As many as 5,000 sea otters, 300 bald eagles, 350 harbor seals, 13 killer whales, and perhaps one-third of a million seabirds died as a direct result of the oiling of waters and 1,500 miles of coastline. These and other species were also indirectly affected with nonlethal injuries, habitat degradation, and feeding and reproductive disruption. Salmon and herring fisheries suffered, as did plant and animal species living in shallows below low tide. Certain populations of plant and invertebrate species in heavily oiled intertidal-zone areas were devastated. The whole event exposed the financial fears of a corporate giant, the economic fears of Alaskans, and the environmental fears of all who want a better world. Most of all, however, it revealed the power of life, given time, to heal itself and carry on. It is a lesson to travelers as well. So many of us have been attuned to the fragility and growing rarity of species and ecosystems throughout the world that we may have forgotten there is another side. In the zeal to "do something" about the Exxon Valdez spill, well over a billion dollars was spent by Exxon ($900 million in a court settlement alone), much of which, from several perspectives, was wasted. Painstaking cleaning of oiled birds and mammals saved only a few, and many of those, it appears, died shortly thereafter. Hundreds of tons of absorbent material used to sop up oil from the seas and beaches went into landfills or were incinerated, creating problems of a different sort. Its estimated that more oil was burned by ships, planes, and vehicles in the clean-up than was spilled. The miles of shoreline that were scrubbed by pressure hoses are in worse shape biologically (in some respects) than stretches that were left alone. Today, more than a decade after the spill, signs of disaster are few and obscure. In general, wildlife populations have recovered. Oil still found ashore is often that driven deep into the beaches by high-pressure cleaning hoses. Chemical analyses of air, water, plants, and animal tissue show limited and diminishing effects. People can be confident that their efforts contributed positively to this healing in general, but the more vivid impression is that of the marine and coastal environment healing itselfthanks in large part to rough weather and natural chemical processes. Strong overall numbers within species have supported recoveries of many local populationsthough harbor seals, sea otters, certain salmon runs, Pacific herring, and several bird populations still show regional lack of recovery. But that is the nature of healthy, wild systems! The land and wildlife of Alaska have been challenged time and time againwith glaciation, volcanoes, tsunamis, war, rapacious mining, over-hunting, over-trapping, and over-fishing, as well as a major oil spill. Because it is vast and wild, however, the power of life to accommodate and respond has so far been sufficient for full, if scarred, recoveries. The details of ecologically sensitive travel are second nature to many of us. We dont feed the animals. If we pack it in, we pack it out. We put fires dead out, take only pictures, and leave only footprints. But the traveler in Alaska has a greater responsibilitythat of fighting for the continued existence of the wilderness itself. Americans have a remarkable inheritance in their public lands. There are those who think of them as "federal" or "government" lands, but the truth is that the lands are oursthough we are more stewards than owners. Even non-citizen visitors share the responsibility of stewardship of American public lands, for the legacy we leave to future generations is ultimately one for all people. The risk for Alaska lies in its very value. It is remote, difficult to encompass, and hard to be aware of from far away. A road here, a power line there, a new mine over the hill; before you know it, the wilderness has been nickeled and dimed out of existence. While in Alaska, its hard not to be a responsible tourist. Unlike fragile natural destinations in poor countries, the regulations that govern the activities of tourists and tour operators alike are thoroughly developed and assimilated. Due to the economic importance of tourism, Alaska is quick to incorporate modern travel ethics and sensibilities. The real challenge is to help permanently secure the future of the larger wilderness. Alaska is truly Americas last frontier. "Last" means either the last to fall or the last to remain. Its our call. Many guides and outfitters serve travelers with outstanding, nonintrusive, environmentally sensitive options. Such companies are often members of the Alaska Wilderness Recreation and Tourism Association, or AWRTA (AR-ta). This nonprofit umbrella organization promotes "sustainable recreation and tourism for a quality future." Members are strongly encouraged to adopt AWRTAs ecotourism guidelines and subscribe to the organizations larger goals. Many AWRTA-member businesses are included in the regional and appendix listings in this book. You may want to contact AWRTA directly for specific assistance and current information, especially if you are planning to book tours or adventures in advance. They are a good one-stop information source. AWRTA members are likely to pay a bit more than lip service to environmental ethics, though you are ultimately responsible for the impact of your visit. Its also true that most non-member companies are decent, honest, knowledgeable, and fully aware of the environmental implications of their activities. Contact AWRTA at 2207 Spenard Road, Suite 201, Anchorage, AK 99503, (907) 258-3171, info@awrta.org, http://www.awrta.org.